In an earlier article, I discussed how Lovecraft governed New Age writer Jacques Bergier’s investigations into the ancient astronaut theory for Morning of the Magicians (1960), the most influential ancient astronaut text ever written (Erich von Daniken, Robert Charroux, and David Childress cribbed shamelessly from it). Some critics, however, do not believe that Lovecraft played a role in Bergier's development of the ancient astronaut theory in 1960. In light of the questions surrounding Lovecraft's influence on Bergier, it's relevant to review Bergier on Lovecraft from Extraterrestrial Visitations from Prehistoric Times to the Present (1970; English trans. 1973), a deeply weird book, perhaps the strangest ancient astronaut book I’ve ever read. The unnamed translator of the book, whoever he or she was, clearly had no real understanding of the material being translated, making an already obscure text that much more bizarre. Thus, in the first excerpted passages, the name of Lovecraft’s Old Ones is a bit butchered. Throughout, Bergier makes plain his debt to science fiction in general and H. P. Lovecraft in particular for inspiring his investigations into prehistory; even where unnecessary, Bergier emphasizes parallels between Lovecraft and the ancient mysteries he relates. Extraterrestrial Visitations is a deeply European book, beginning with the author’s insistence that he held an “exclusively rationalist position” even as he then proceeds to pile speculation upon speculation, often without any factual support, in the name of inductive reasoning. He assumes the reader is already familiar with the mysteries he discusses, leaving out conventional references, background information, and anything more than allusions to Victorian newspaper clippings and Fortean speculation. As a result, the text is frequently obscure, understandable only with a deep familiarity with the ancient mystery genre—and with Lovecraft. 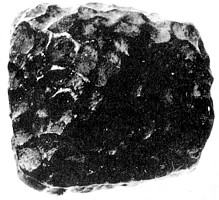 Bergier devotes a chapter to the infamous case of Dr. Gurlt’s cube, which he describes as being a 60 million year old perfect cube made of iron, with two opposite faces slightly curved. It had been found in a mine in Austria in 1885, and Bergier made three false claims about it: first, that it is perfect in form; second, it is an extraterrestrial recording device meant to transmit information about earth to outer space; and third, that a conspiracy is responsible for having made the object “disappear” from the Salzburg Museum so scholars like Bergier could never confirm its extraterrestrial origins. The Gurlt "Cube" in a Victorian engraving. It was then, in the gathering twilight, that he thought he saw a faint trace of luminosity in the crazily angled stone. He had tried to look away from it, but some obscure compulsion drew his eyes back. Was there a subtle phosphorescence of radio-activity about the thing? What was it that the dead man’s notes had said concerning a Shining Trapezohedron? [...] Of the Shining Trapezohedron he speaks often, calling it a window on all time and space, and tracing its history from the days it was fashioned on dark Yuggoth, before ever the Old Ones brought it to earth. It was treasured and placed in its curious box by the crinoid things of Antarctica, salvaged from their ruins by the serpent-men of Valusia, and peered at aeons later in Lemuria by the first human beings. It crossed strange lands and stranger seas, and sank with Atlantis before a Minoan fisher meshed it in his net and sold it to swarthy merchants from nighted Khem. The Pharaoh Nephren-Ka built around it a temple with a windowless crypt, and did that which caused his name to be stricken from all monuments and records. Based on these close similarities, I would suggest that Bergier’s alternative explanation for Gurlt’s cube is dependent upon Lovecraft’s Trapezohedron. The most telling point is the last sentence of Bergier’s that I quoted above. Despite spending his chapter discussing objects shaped like cubes, spheres, and cylinders, he refers to them collectively as “angled object[s].” This tells me that he had as his model the “crazily angled” Trapezohedron, and not the regular geometric forms of the “real” alien communication devices he purports to discuss. Note: This article is an expanded and adapted version of a post that first ran on my blog.